The skills of understanding and communication underpin all that we do in life and we learn these skills in the area of the primary curriculum called English. English is taught in a relevant, valuable and meaningful way at Baydon St. Nicholas. English comprises three main strands; speaking and listening, writing and reading. It is taught through termly topics and these are planned so that children not only experience a range of genre but also have opportunities to write, speak and read for different purposes and audiences whilst drawing on their developing knowledge and understanding of English. English is taught daily with some skills such as handwriting, spelling patterns, phonics, grammar and punctuation being taught discretely. We use the Penpals handwriting scheme and children practise some aspect of their handwriting every day. This results in our children developing a neat, legible, joined-up handwriting style. Children develop an understanding of different writing styles by studying and analysing good examples of these styles. Children are encouraged to focus on VCOP (vocabulary, connectives, openers and punctuation) when they write as well as PAF (purpose, audience and form). Writing is always linked to termly topics and is often the focus of classroom displays because we place a high value on good quality writing. Reading is taught as soon as our youngest children start school in their reception class (also known as Foundation Stage 2) with the teaching of systematic synthetic phonics using the multi-sensory ‘Jolly Phonics’ and moving onto ‘Letters and Sounds’ in Key Stage 1. Daily phonics sessions result in the speedy acquisition of blending skills which allow children to read phonically regular words. The children are also taught to recognise high frequency phonically irregular words. Reading books are banded and children progress through these bands as reading and comprehension skills develop. Books are derived from a number of different reading schemes and are constantly being updated and added to. We make a point of having a range of books from as many different genre as possible. Although we teach reading so that children can access the rest of the primary curriculum we also try to promote a love of reading which will hopefully last a life time! 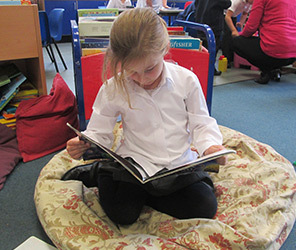 Teachers across the school read to their classes regularly and children are encouraged to ‘try out’ books from the wide range of books in school. Older children (upper Key Stage 2) enjoy sampling books from the mobile library which visits the school every other week and a visit from one of the Wiltshire Council’s librarians in the summer term encourages children to take part in the Wiltshire libraries reading challenge during the summer holidays. We have also had two very successful ‘Extreme Reading’ recently. We are fortunate enough to have a number of parent helpers who come into school to listen to children read either individually or in groups. Teachers also listen to children read on a regular basis both individually and in guided reading groups. Children from Foundation to Year Six are encouraged to speak fluently and eloquently. They are given opportunities to express their feelings, opinions and ideas in relation to topic work and ‘real’ life. Children are encouraged to think about how they speak to and with others, how they speak in a role play or drama situation and to analyse how others speak and what they say. 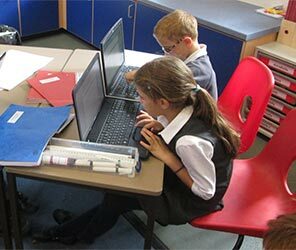 At Baydon St Nicholas, we acknowledge that ICT should permeate all parts of the curriculum in this technological age. In line with ‘Every Child Matters’ children will need ICT capability to achieve economic well being and will need to understand electronic communications in order to enjoy and achieve and to stay safe. We believe our pupils should be given opportunities to become familiar with a range of information technologies and to develop the skills to use them, thus developing into confident, independent and discerning users of ICT. Therefore, we are committed to the on-going development of the ICT capability of pupils and staff. At Baydon St Nicholas School, we understand the importance, to learn a modern foreign language. In our school we have chosen to learn French in order to reach into Europe and further afield, and have established strong links with St. John’s MFL department in order to facilitate transition from primary to secondary education. We give the KS2 children, wherever possible, context for their language learning and have held fashion shows and total immersion days in French and used French in our Harvest, Easter and Christmas celebrations. Our children take part in the annual MFL festival, held at St. Johns and have made great progress in their learning of the subject. They find the language tricky, but great fun!